Hi everyone, I’m back not with a recipe, not with a restaurant review and not with facts about my favorite super foods. I am going to review the latest cookbook I received which totally blew me away and its by Bobby Flay, Iron Chef, specializing in Southwestern cuisine. Who woulda’ thunk it? Certainly not moi! You can purchase this book at Costco for around 25.00$ CAD. I’ll give you a little background….In my review of Florida’s amazing Canyon’s Restaurant, which serves up the best Southwestern food I’ve ever had to date, I kinda poked fun at Bobby Flay saying that Canyon’s was unbeatable and that Bobby Flay should “move over”. I also included a not so nice photo of him. Before discovering Canyon’s, I had gone to Bobby’s Mesa Gill in Bahamas and wasn’t thrilled. Although it was gorgeous and had a great atmosphere, the food tasted, well, I can’t tell you how it tasted...It was blindingly spicy. So when I went to Canyon’s – I felt like “Bobby Flay, move out-of-the-way” for this southwestern-cuisine-treasure I had discovered. Check out Canyon’s review. Well, I was blown away recently when I picked up his new cookbook “Bar Americain”. It was so impressive to me that I felt compelled to share my thoughts with you. It’s not just the recipes, but how he writes and his consideration for the reader who may be, as I am, a novice. 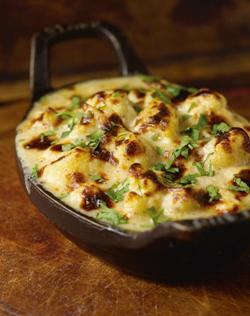 He features recipes that he is currently serving up at his new Resto, Bar Americain in New York. This shows that to a certain degree, he’s not keeping his trade secrets for himself. It was the first time that I’ve bothered to read the introduction or the notes at the beginning of a recipe. In his intro, he describes how he started out as a high school drop out (but later graduated with an equivalency diploma) and was kinda’ just hanging out with friends everyday with no goals in sight…bumming around..when his Father got him a job working at a friend’s restaurant. That’s where his passion was born….He also explains how he came up with the name Bar Americain, which is quite interesting and he does it in such a way where you can imagine yourself in his shoes…The whole book is that way! He seems very real and down to earth. I even thought that if I ever had the opportunity to write a cook book, that’s how I’d write it or I’d aspire to.. In that same tone, like I speak – accessible. I was astounded as to how many recipes he shared in one book. He could have easily shared less or put it into two books. The book isn’t that thick but it is packed with recipes and variations. What I also loved is that if he lists an ingredient which may be hard to find, he includes a simple substitute. With other books including some of my fav’s, I’ve had to look on-line for substitutes. A quick run through: Pictures are vibrant and appetizing.. There’s a whole chapter on cocktails…nice…He includes instructions on how to make the different syrups like mint and cinnamon….different variations etc..
Next, is a long list of salads and soups including, Vidalia onion soup with parsley pesto, clam chowder, chopped apple salad and Kentucky Ham salad to name a few. I didn’t know that in the state of Kentucky had their own prosciutto-like ham! He serves that up with pecans, ricotta, black mission figs with a molasses-mustard dressing. Sounds goooood. Next are sandwiches. The one I really want to make is the swordfish club sandwich with lemon mayo and thick cut bacon. If you’ve never had swordfish, it has a similar consistency to chicken, which makes a perfect substitute! Although every sandwich in this chapter looks awesome. Next…an endless chapter of appetizers. You must try the BBQ-ed oysters with tarragon-butter. Then there are the Fish and Shellfish, Poultry and Meat, Sides, Brunch (YES BRUNCH!!) and Desserts. I have to run through now because I am not only getting very hungry but this post will be too long if I go chapter by chapter! At the end of the book, there’s a whole section for sauces and stocks including his BBQ sauce, chive oil and much more. Among the things that excited me in this book is the Green Chile Spoonbread! It’s a softer version of cornbread. 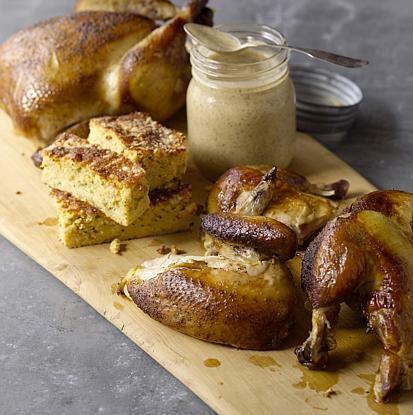 He describes it as a cross between soufflé and cornbread. I will be attempting the Pulled Barbecued Duck Sandwich. Who wants to come over and try this when I make it? Here’s an excerpt..
“This is an obvious play on the southern pulled pork sandwich, which is typically made with braised pork shoulder. Duck legs are an interesting upgrade. While duck breast s are best cooked quickly and rare, the legs need to be slow-cooked to make them tender. I believe in employing strong flavors such as fresh ginger, star anise, fennel and cinnamon to cut through the richness of the duck. The pickles and coleslaw were optional but I can’t imagine having pulled pork or pulled duck sandwich without them. That crunchy, vinegary bit of freshness truly rounds out the sandwich.” Bobby Flay – Bar Americain Cookbook. 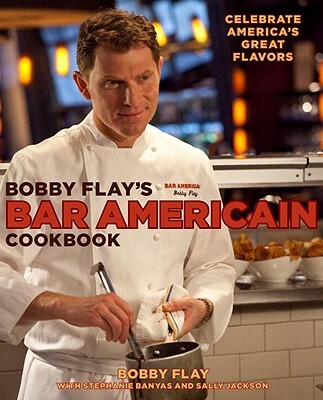 An interesting conclusion: I feel now, I have totally overlooked and misjudged Bobby Flay who’s book was thorough, creative and accessible He turned out to be an excellent and inspiring teacher. Can’t wait to pick this book up!